Almighty and everlasting God, we thank you for your servant Alexander Crummell, whom you called to preach the Gospel to those who were far off and to those who were near. Raise up in this and every land evangelists and heralds of your kingdom, that your Church may proclaim the unsearchable riches of our Savior Jesus Christ, who lives and reigns with you and the Holy Spirit, one God, now and for ever. Alexander Crummell was born in New York City in 1819, and wished to study for the priesthood, but received many rebuffs because he was black. He was ordained in the Diocese of Massachusets in 1844, when he was 25 years old, but was excluded from a meeting of priests of the diocese, and decided to go to England. After graduating from Cambridge, he went to Liberia, an African country founded under American auspices for the repatriation of freed slaves. 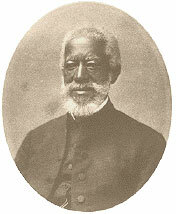 Crummell hoped to see established in Liberia a black Christian republic, combining the best of European and African culture, and led by a Western-educated black bishop. He visited the United States and urged blacks to join him in Liberia and and swell the ranks of the church there. His work in Liberia ran into opposition and indifference, and he returned to the United States, where he undertook the founding and strengthening of urban black congregations that would provide worship, education, and social services for their communities. When some bishops proposed a separate missionary district for black parishes, he organized a group, now known as the Union of Black Episcopalians, to fight the proposal.